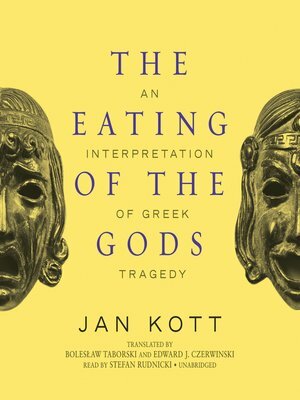 In The Eating of the Gods the distinguished Polish critic Jan Kott reexamines Greek tragedy from the modern perspective. As in his earlier acclaimed Shakespeare Our Contemporary, Kott provides startling insights and intuitive leaps which link our world to that of the ancient Greeks. The title refers to the Bacchae of Euripides, that tragedy of lust, revenge, murder, and "the joy of eating raw flesh" which Kott finds paradigmatic in its violence and bloodshed. Whether reflecting on Prometheus or drawing a modern parallel in Beckett's Happy Days ("the final version of the Prometheus myth"), Kott's vision is brilliant, his method innovative, and his sensibility consistently new. Since this book first appeared, Kott's connection between ancient and modern have become even more compelling in their immediacy.